Anime OST is an important part of an anime, which can help us to easily understand the stories or the feelings of characters. And those beautiful anime songs always deeply touch and motivate us. I believe many anime fans like to collect the wonderful anime songs, play them with mobile devices, use them as ringtone or for other usages. However, you may find that sometimes it’s hard to find desired anime music resource. 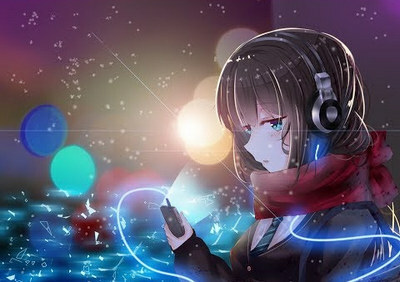 Given that there are many anime music download sites but you need to take much time to find a right one, this article introduces the top 7 sites that are safe and useful to download various anime songs you like. Please make sure you comply with your local laws before downloading any free anime music contents. 1. Anime.thehylia.com: The most popular site with massive resources for you to download anime songs easily. 2. Gendou.com: Download videos, music you like and share anything about anime with others. 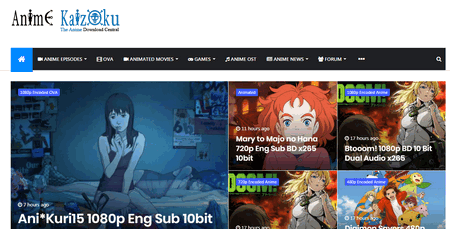 3. www.mp3.animaniaclub.com.br: Everything about anime, such as anime video, anime music, anime wallpapers and so on. 4. Downloads.khinsider.com: It has kinds of video game music and anime OST. New contents are frequently updated. 5. Mp3anime.tk: Listen and download Anime Openings and Closings. 6. Animekaizoku.com: Download high quality anime series, OVA, music as you wish. 7. Music.forunesia.com: Free feel to download kinds of anime music albums and songs. 1. 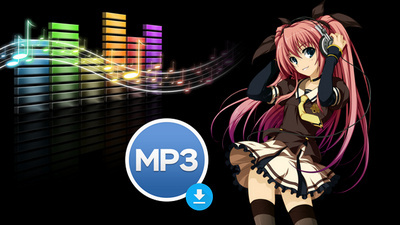 Convert anime music to MP3 and other 300+ audio & video formats. 2. Offer the optimized presets for iPhone and Android phone. 3. Download Videos from YouTube, Facebook, Twitter, Vimeo, etc. 4. Extract audio from anime videos with 1:1 flawless quality. 5. 100% clean, free, reliable and easy to use. 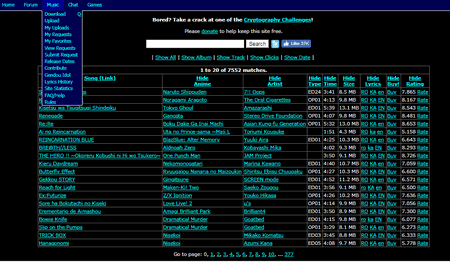 Anime.thehylia.com is one of the most popular anime mp3 download sites. 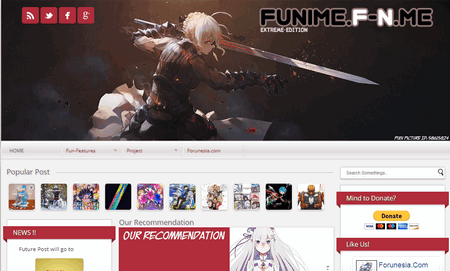 It owns massive anime music resource, and kinds of anime OST can be found there. The total archive size is over 8000GB and more than 70000 songs are available. You can download most popular series, episodes, albums and songs on this website. To download anime music in MP3, you can use the search bar on the upper right corner to search the desired songs or select the “Music MP3” to find anime albums. After finding the target source, right-click “Download to Computer as MP3” and choose “Save link as…”to save this song easily. 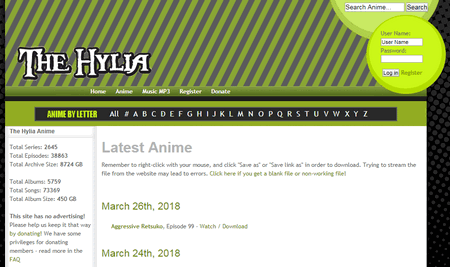 Anime.thehylia.com is free to use and has no advertising. When talking about sites to download anime songs, you can’t miss Gendou. Gendou is popular with anime fans and there you can communicate with others about anime on Gendou Forum and Chat channel. Besides offering anime music and video, it also has some interesting anime games. Gendou is a registered-users only website. After successful registration, you can log into your account and access to all the contents on this website. After finding the desired anime song, you only need to click the song link to download it. www.mp3.animaniaclub.com.br collects various of videos, images and music for downloading. It’s a great free MP3 download site for fans to download anything about anime and the new MP3 songs are added constantly. The website is well-designed and you can search what you are interested in with the help of the search bar or use the quick search box. Things need to be noticed that www.mp3.animaniaclub.com.br is a non-English website and you need to register an account to download anime music MP3. The interface of Khinsider is similar to Anime.thehylia.com. So far, it has over 400000 songs yet some of the songs are game soundtracks. Even so, you can easily find almost all anime MP3 music on Khinsider. Khinsider offers easily searching options for users to type the name of the target song to get anime soundtrack downloads in the search box and click search. You can also pick an initial letter of a song to find music. You don’t have to register. After finding the anime music, right click it and select “Save Link As...” to download the file. Mp3animer.tk is a clear and concise website. 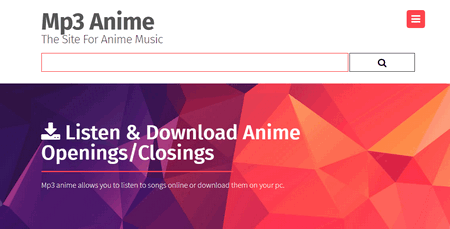 It offers quite a number of MP3 anime openings and closings. Just type the name of the anime music to the big search box and play and download the music. You can also try the randomly play feature to start playing anime music from its database. Although you don’t need to sign up for downloading anime MP3 downloads, if you’re interested, you can simply create an account so that you’re able to make a playlist, heart this song and access to all its features. On Animekaizoku, you can download kinds of 1080p, 720p, 480p, 360p Anime episodes, movies, games, and high-quality anime OST. Meanwhile, you’re able to know more about the synopsis of the anime and the characters when you open an anime song for downloading. Animekaizoku offers not only anime OST MP3 downloads but also FLAC. You can free download anime songs through Mega, yet you have to put up with the ads, shorteners and daily limits on mega. To get rid of those limits and inconveniences, you need to donate more than 15$ or get access in other ways as its announcement shows. On music.forunesia.com, you can directly download anime music album or download the single songs in an album. All the recent and popular anime music album are listed on its homepage as posts with tags. Open the post you’re interested in to download the audio files in the playlist or download the full album free at ease. There are many other interesting features on music.forunesia.com. For anime fans, it’s really a good place to download anime songs. Free HD Video Converter Factory is an all-purpose downloader that enables you to download anime videos from YouTube, Facebook, Vimeo, CNN and other 300+ websites and convert them to MP3, WAV, FLAC and more as you wish. Its built-in editor and ringtone maker can help you to edit anime MP3 files by merging, cutting and make charming ringtones easily. How to Download Anime Music with the Free Anime Music Downloader? Before start, please free downloadfree download the software and install it on your PC. Step 1. Copy the anime music URL and run Free HD Video Converter Factory to download anime music. Click on “Download Videos”. Step 2. Paste the anime music URL to the box and click on “Analyze”. Step 3. Soon the URL will be analyzed successfully. The formats that you can download for the audio will be listed. Choose the desired one and click on “Download” button to download anime songs. Tips. If you need an anime MP3 audio but the analyzed URL doesn’t have MP3 format, follow the steps to convert Anime music to MP3: Click on “Output Format” button on the right of the main-interface > select “MP3” under “Audio” tab. > Click on “Run” on the right corner to start the conversion. In summary, Free HD Video Converter Factory is a useful tool to save online anime music, anime videos as well as movies, and convert anime video and music to MP3 and other formats as you wish. Moreover, you can use it to compress video file size for freeing up the storage space of devices. Install it to know more useful features.